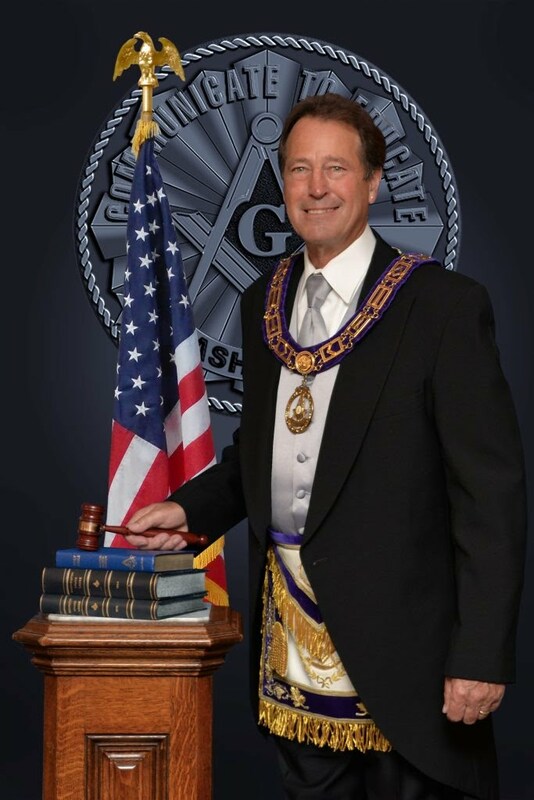 For the first time in many years, Grand Lodge was held in Vancouver, Washington. It was quite the treat for North Bank, as well as the lodges around District 19, to be involved in and attend this fantastic event. Beyond the fun of attending Grand Lodge, many of the brothers from North Bank were quite involved in helping out! WM Mac Parker was quite engaged, helping out at the Senior Warden's Breakfast at the Vancouver Masonic Center, as well as opening Grand Lodge on one of the session days. VWB David Emmerton found himself behind a camera, assisting with the production of the event. Br. David Coffing, current WM of Washington Lodge #4, accompanied MW Sanders on the stage for nearly the entire event. Br. Kurt Gazow worked on the transportation team, transporting visiting dignitaries and their spouses to and from the airport and VMC, as well as around the Vancouver area. Br. Kurt will also be serving on the GL Technology Committee for 2012-13. A fantastic opportunity to meet our Brothers from around the state, around the country, and around the world (really)! We have had several fantastic lodge meetings in the past month. Brother Rennie Johnson was welcomed back North Bank after being out due to illness. Brother Art Liss also returned to lodge at our last meeting of the year, and spoke to the lodge about his plans for outreach to the community, as well as to Masons of North Bank who may not have sat in Lodge for a few years. Brother Art has some great ideas, and we all look forward to assisting him in any way that we can. North Bank also hosted a few visitors at their last meeting of the year. Brother Eric Gazow from Portland Lodge #55 was in attendance, Brother Kurt Gazow's father. One of these days, we may convince Br. Eric to make himself a more permanent member of our Lodge.. ;-) In addition to this, North Bank received a visitor from out of state! Brother Ed Nelson visited North Bank on his recent trip to Washington State. Brother Ed's home Lodge is Orland Laurel #245 in Orland, California. This was Br. Ed's first visit to a lodge out of his jurisdiction, and we were happy to receive him and share some fellowship during his visit. We were also pleased to see Brother Duane Bailie come back for a visit to the Lodge! Brother Duane, known in the HAM community as W7COD, made his first visit in a while to North Bank. He and Brother Kurt had a chance to talk radios for a while, which Brother Kurt enjoyed quite a bit! Come back any time, Brother Duane; we'd love to see you more often! A special treat at North Bank's last meeting was a presentation to Br. Rennie Johnson. As many Masons around our District (and beyond) know, Rennie puts his heart and soul into Masonic service, and has been there for North Bank at every turn, from serving in the officers line, to coordinating the crab feed, to any other task asked of him. WM Mac Parker recognized Rennie's outstanding work for North Bank by presenting him with the Hiram Award, honoring his service to our beloved Lodge. We all appreciate Rennie's efforts, and look forward to many more years of fellowship with him! A group of North Bank members were able to make a visitation to Washington Lodge #4's last Special meeting of the year. The theme of the night was Hawaii'n Barbecue, complete with Hawaiian shirts, shorts, and flip flops. Lodge didn't open, but a great evening of fellowship was had by all. Kurt Gazow, Anthony Crawley, Art Liss, and Don Fitzgerald were in attendance, and congratulated WM Dave Coffing on a successful year in the East, as well as enjoyed some great BBQ ribs and tri-tip! As ever, the Masons of Washington 4 were very hospitable; we look forward to returning the favor! As we separate for the Summer and the Lodge goes dark for a few months, that doesn't mean we won't be sharing a little fellowship here and there! Many of us plan to get together for a few ad hoc activities over the summer months, perhaps paying a visit to a few active local lodges. In August we will have the annual North Bank picnic at the Haukass residence. For my part as web master, I'd welcome a call for a cup of coffee or lunch with any of the brothers who are interested in getting together. Don't be a stranger! That's it for now. Look for more updates this Summer as our brothers report in on their activities. If I don't see you before then, I look forward to seeing you at our Summer BBQ. Take care!